Kerri Walsh Jennings is a pro beach volleyball player. Walsh Jennings and teammate Misty May-Treanor were the gold medalists in beach volleyball. She is a five-time Olypian who competed in five consecutive Olympic Games in 2000, 2004, 2008, 2012 and 2016. She has won 3 gold medals for the 2004, 2008, 2012 Olympics and became the all-time most decorated beach volleyball Olympian when she won a bronze medal in the 2016 Olympic Games. Walsh Jennings and teammate, Misty May Treanor, were the gold medalists in beach volleyball at the 2004, 2008 and 2012 Summer Olympics. They have been called “the greatest beach volleyball team of all time winning 21 consecutive Olympic matches and losing only one set to Austria in 2012 during their 11-year run together. PFP Sports & Celebrity Talent Agency is a booking agent for motivational sports speakers and celebrities. 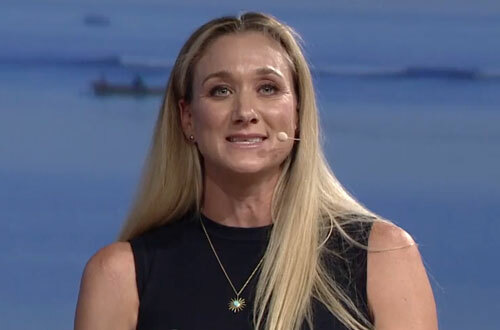 If you would like to book Olympic speakers like Kerri Walsh Jennings for a speaking engagement, personal appearance or special event, you can request Kerri Walsh Jennings agent and speaker information from PFP Sports & Celebrity Talent or call 800.966.1380.